Sailors, fishermen and cruise passengers should be on the alert. 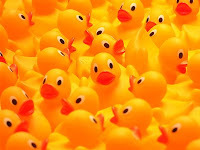 If anybody spots a yellow rubber duck bobbing on the ocean waves, Nasa would like to know. The US space agency has yet to find any trace of 90 bathtub toys that were dropped through holes in Greenland's ice three months ago in an effort to track the way the Arctic icecap is melting. Scientists threw the ducks into tubular holes known as "moulins" in the Jakobshavn glacier on Greenland's west coast, hoping they would find their way into channels beneath the hard-packed surface, to track the flow of melt water into the ocean. SIGGRAPH encourages paper submissions on topics that explore the creation of art and its place in society, helping people understand the changing roles of artists and art creation in the increasingly computerized, online world. The papers should present challenging ideas in accessible ways with the goal of informing artistic disciplines, setting standards, and stimulating future trends. In addition to the core topics of the digital arts and interactive techniques, Art Papers will also be accepted on the theme of the SIGGRAPH 2009 juried art gallery, BioLogic Art. Art Papers submissions will be accepted through 8 January 2009 at 22:00 UTC/GMT. New this year, SIGGRAPH will collaborate with Leonardo, (The Journal of the International Society of the Arts, Sciences and Technology) to publish a special issue specifically highlighting SIGGRAPH 2009 Art Papers. Publication of this special issue will coincide with SIGGRAPH 2009, and will also include visual documentation of works exhibited in BioLogic Art. "SIGGRAPH concerns itself with the innovation and education crossroads of art, science, and technology," stated Jacquelyn Martino, SIGGRAPH 2009 Art Papers Chair from IBM T.J. Watson Research Center. "So, naturally we are thrilled to collaborate with Leonardo in the publication of this year's Art Papers. We hope to further emphasize the process and research behind the creation of art in today's digital world as well as its greater impact on our society and culture." Art Papers at SIGGRAPH 2009 will be presented in 20-minute sessions by their authors, with the opportunity for participants to pose questions following the presentations. A full schedule of accepted Art Papers will be available online in May 2009. For complete details on the SIGGRAPH 2009 Art Papers program, including submission information and deadlines, visit http://www.siggraph.org/s2009/submissions/art_papers/index.php. What is the future of cash or a world without cash? It is another project from fiction writer Bruce Sterling and many others, like "we-make-money-not art" Regine Debatty and Irene Cassarino, the manager of the online collaborative cinema project "A Swarm of angels".